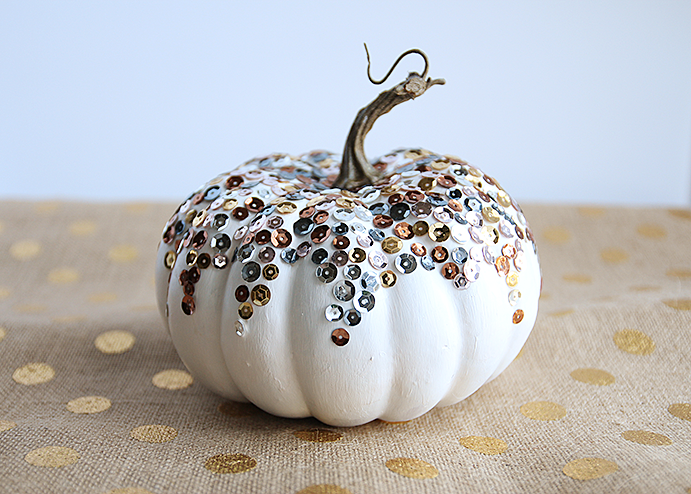 Sticking with yesterday’s theme of glamorous pumpkins, today’s pumpkin DIY is all about the sparkle! Paint your pumpkin, and let it dry completely. You might need a couple of coats of paint for optimum coverage. Since I used a faux pumpkin, I pulled the stem off prior to painting and then reattached it with hot-glue once my pumpkin was painted and had dried to avoid getting white paint on it. Otherwise, you can just tape off the stem when painting. Once your pumpkin has dried, get to gluing! I started at the base of the stem and just worked my way down. I glued each individual sequin [yes, this is somewhat of a time-consuming DIY…], but you could also paint the glue with a brush or sponge brush and then stick your sequins on, however the glue tends to dry quickly so the sequins might not stick as well. Be sure to follow along on Pinterest for more Fall + Halloween decorating ideas!